Apple's iPhone is expected to enter Canadian market. Unfortunatly exact date is not announced but it seems to be nice when service get wider. 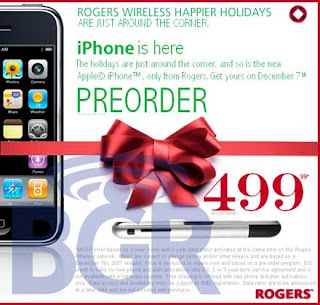 So do Rogers Communications Inc..
Demand for Apple's iPhone is very hight not only in canada I mean worldwide. Russia makes it fashionable and phone appears trendy the latest must-have for Russia's elite, numbering about 500,000 in all in the country already. This is despite the US$700 price that iPhones sell for in that country. Of course, this is nothing compared to the $1,800 it sold for when it was first launched in the US. I see Apple's iPhone does not gives up. Repid market share and hight distribution lives it’s results - people like it so much. So we have to be patient and wait for the next announcement but may be iPhone already brouhgt to canada. Who knows? Even Ted Rogers keeps silent.